Our Association was created in Warsaw in 2014. We deal with the promotion of health and popularization of techniques to support personal progress, culture, education, science and citizen and national awareness. We offer the cycle of meetings called "Inner Gardens" - these are part of the lecture-training program named "University of Integration"; which is directed to local communities including Seniors Clubs, Centers of Local Activities and Centers of Health and Personal Progress. These meetings will be implemented in different towns and cities across the UK, Poland and abroad. The end and the summary of the cycle of meetings is expected to be February/March 2016 during the Conference of "Inner Gardens";. The cycle was launched on the 21st of October 2015 in the Pensioner Club in Warsaw. 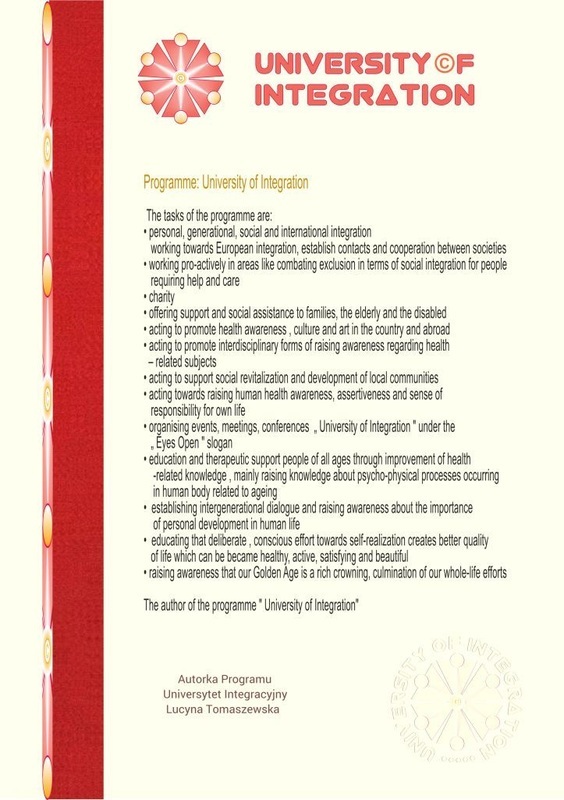 It is based on a group of activities focusing on and shared with the Association of Health and Progress programme "€śUniversity of Integration";. For this purpose we are also going to start co-operating with subjects dealing with similar activities. Representatives and members of the Association of Health and Progress, Instructors of Movement Recreation, Social Animators, Professionals, people with previous experience for action in terms of animations, organization and realization in lots of social initiatives, the promotion of health and personal progress. 1. University of Integration Programme begun as a result of a non-profit event organised by the Association of Health and Progress with the co-operation of the House of Culture in Warsaw, Katowice, Chorzow and Edinburgh. University of Integration Programme had many interesting meetings and received positive opinions that confirmed the social demand for this kind of initiative. The people taking part and co-operating who were involved in our initiatives pointed to the professional introduction, leadership and organization. Those people also highlighted their purposefulness and benefits gained from taking part. The format of provision promoted not only knowledge but also the integration between members. Under the local initiative the University of Integration Programme also received positive feedback. It was supported by the President of Katowice City, Marcin Krupa and also assisted to realization by the charity work of a number of citizens of Katowice with co-operation and support of the Office of City Katowice. The information about our activities has also appeared in the press and TV in Poland and abroad. You are very welcome to cooperate and take part in programms supported by us.